Adolescence usually begins as early as four months and can end as late as two years. Behaviors signaling the onset of adolescence include: loss of house training, spraying, biting, nipping, nest building, destructiveness and courtship behaviors such as mounting and circling. This is a normal part of development, not a sign that something is wrong with your rabbit or that she is bad or mean. It is time to have your rabbit spayed or neutered. 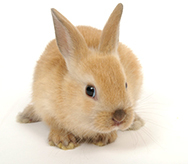 Qualified veterinarians are able to spay and neuter rabbits. Click here for a list of qualified veterinarians in the Milwaukee area.